Luang Phor Kuay was born on November 2nd B.E.2448, in Bankae Village, Sunbury District, Chainat Province. He was the first born and loved very much by his parents, who sent him to be educated by Luang Phor Kuad at Wat Bankae. Although only 6-7 years old Luang Phor Kuay could remember and recite many of the sacred spells he was taught, along with Khmer language and high-level sacred spells. Luang Phor Kuad predicted even at this early age that Luang Phor Kuay would become very successful in the monk hood and as such dedicated himself to teaching the novice monk. Luang Phor Kuad passed away soon after, and as a result, LP Kuay moved to Wat Huaden where he was to further his studies under Ajahn Dum. It was recorded that Luang Phor Kuay had owned a book called “Kru Rang”, which was full of sacred spells. It was said that only monks or ascetics had sufficient sacred power to open and read the volume. Should it be opened by an ordinary person his life may be damned. It was known that the book contained many sacred spells, to dispel evil, protection from weapons, and a scared spell to call upon Mae Thorani, or the goddess of the earth. Wat Tatong, Supunburi Province, kept by Ajahn Tau. Wat Nong-i-duke, Chainat Province, kept by Ajahn Sawang. Wat Kositaram, first kept by Luang Phor Kuay. This copy has never been opened and studied in any detail because of previous experiences of mysterious illness or disease associated with it. 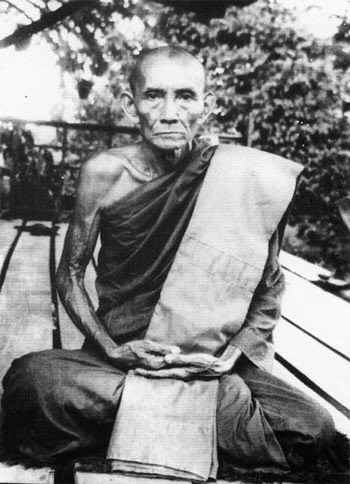 Apart from the book Luang Phor Kuay also learnt magic sciences from many other senior monks such as Luang Phor Puang of Wat Nong Kradone, Luang Phor Kun of Wat Khaokaew and Luang Phor Derm of Wat Nongpo, who it was said taught him about the sciences to create sacred knives and takruts. 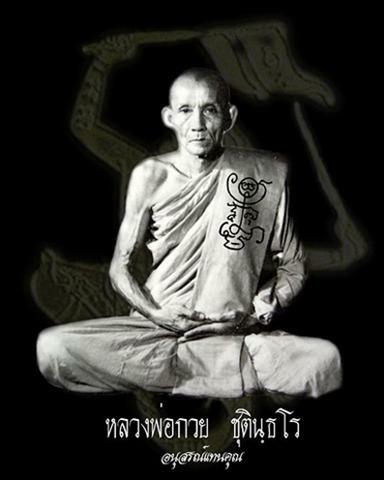 Luang Phor Pumpum of Wat Nongtangoo, a friend of Luang Phor Kuay had said that Luang Phor Kuay was a true monk, who was never afraid of anything which resulted in him learning strong magic. Furthermore it was also said that Luang Phor Kuay had a magic mouth. If he made a prediction, in all likelihood it would be become true. Many people were obviously very inquisitive about where Luang Phor Kuay obtained his scared book. Some of his disciples actually revealed the story to us. Luang Phor Kuay had never expected that he would gain the book but on June 1, B.E.2477, he was staying at Wat Nongkam, Chainat Province where he was learning higher level ancient Thai medical sciences. During that time a monk named Jam had told Luang Phor Kuay that he had found a book, which was hidden in a hole of a dead tree but he could not extract the book because sacred souls were preventing him from doing so. This time all of those sticks were quickly burnt and Luang Phor Kuay could easily extract the sacred manual..
On reading book he found the paragraph which clearly stated that the book was not to be owned by laypeople unless the keeper and family were suffering from incurable disease or other calamity. He focused his attention on creating sacred amulets, takruts, sacred knives, phra pim etc. His amulets were highly respected by the worshippers as they are to this very day especially the somdejs, khun paen & sivali. Even criminals of the province highly respected Luang Phor Kuay and at that time whenever they passed his temple they would shoot once in the air to salute him. Abbot of Wat Bangkae (KOSITARAM). It was recorded that during World War II for example, (B.E.2484) Luang Phor Kuay had given away sacred amulets to many people, who wanted his amulets in particular to help protect themselves from weapons and bombs.